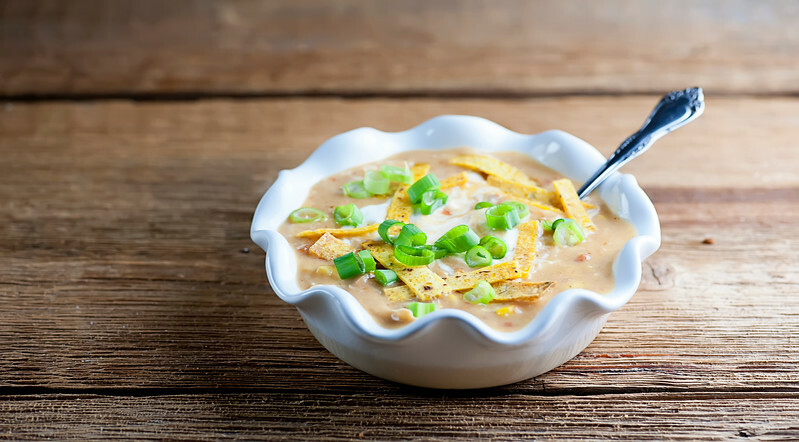 This easy and delicious slow cooker chicken taco soup is as easy as putting all the ingredients into the crockpot, pushing the button, waiting a few hours and ladling it out! We are heading into fall, the season of pumpkins, sweaters, and (in my house) warm and cozy suppers cooked up in my trusty slow cooker. There’s nothing quite like tossing a bunch of ingredients into the slow cooker, trundling off to work and coming home to the delectable aroma of supper being just about ready. And one of the current slow cooker faves in my house is this recipe for slow cooker chicken taco soup. All the flavors of chicken tacos – including the toppings! – in a cheesy, creamy, dreamy, spicy soup version. Ready for some warm and wonderful slow cooker soup deliciousness? Let’s make it! I think fall is my favorite season. Cozy sweaters. Fires in the fireplace. And of course, there is my favorite foot warmer. Oh, and college football season. 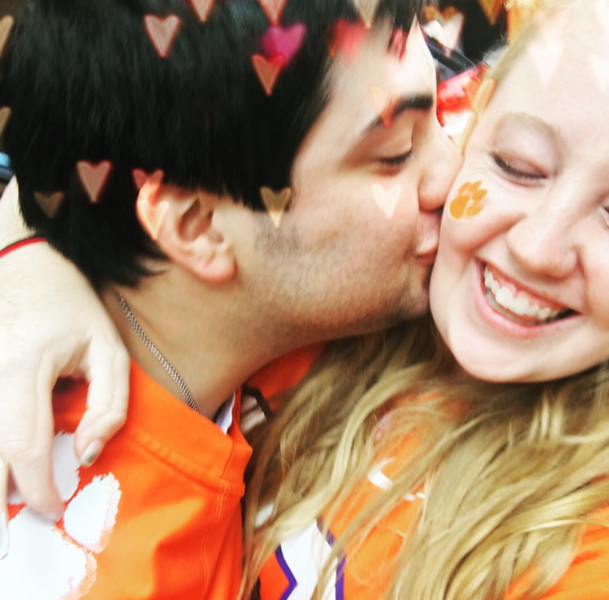 We are die-hard Clemson Tiger fans, which might have something to do with the fact that the Southern daughter and her sweetheart are Clemson alumni. Which makes the Southern husband and I honorary Tigers. We are heading down there this weekend for the Boston College game, and I am expecting deliciousness both at the tailgate and on the field. GO TIGERS! Meanwhile back at the slow cooker, you are going to mix up some condensed cream of chicken soup with some chicken broth, some salsa, some frozen corn and some cumin and pour it into the cooker. Add some boneless chicken breasts, push the button and go about your day. When suppertime rolls around, you are going to take out the chicken, shred it up, and then return it to the cooker with some shredded cheese. 15 minutes later it will be ready for you to dish out and add some taco-appropriate toppings. I’m here to tell you that a swirl of sour cream in this soup is crazy good. We also like some tortilla chips on our soup. Sometimes I use the store-bought kind, and sometimes I go all out and make them myself, as I do in this post for chicken chilaquiles. One way or the other, dust off your slow cooker and let’s welcome fall in with some taco soup! This easy and delicious slow cooker chicken taco soup is as easy as putting all the ingredients into the crockpot, pushing the button and ladling it out! Mix together soup, salsa, corn, broth and cumin and pour into your slow cooker. Place chicken on top and cook on low for 8 hours. Remove chicken, shred into small pieces and return to the slow cooker along with the cheese. Cover and continue cooking until cheese has melted, about 10-15 minutes. Stir and ladle into bowls. 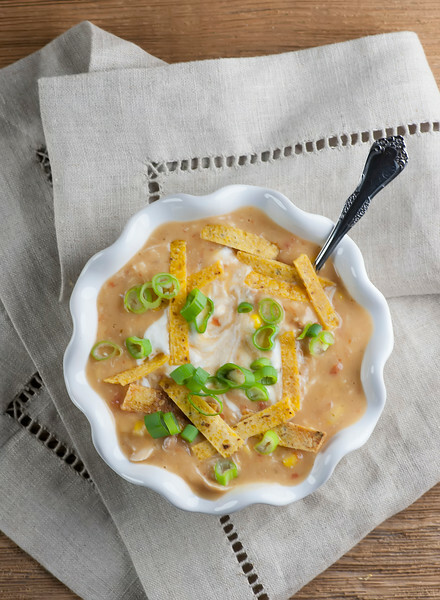 Top each bowl with a dollop of sour cream, a handful of chopped scallions and some tortilla chips and serve! Yum, making this tomorrow. Thanks for another great recipe. We did love it, I made a big batch in my large slow cooker. Fall is upon us! I cut this out of the paper when I saw it in the Record a while back and finally made it today. It was delicious exactly as it, and the family all loved it. I served it with the Trader Joe’s organic corn chips. I love your recipes, they are so straightforward, never overly complicated and always delicious.